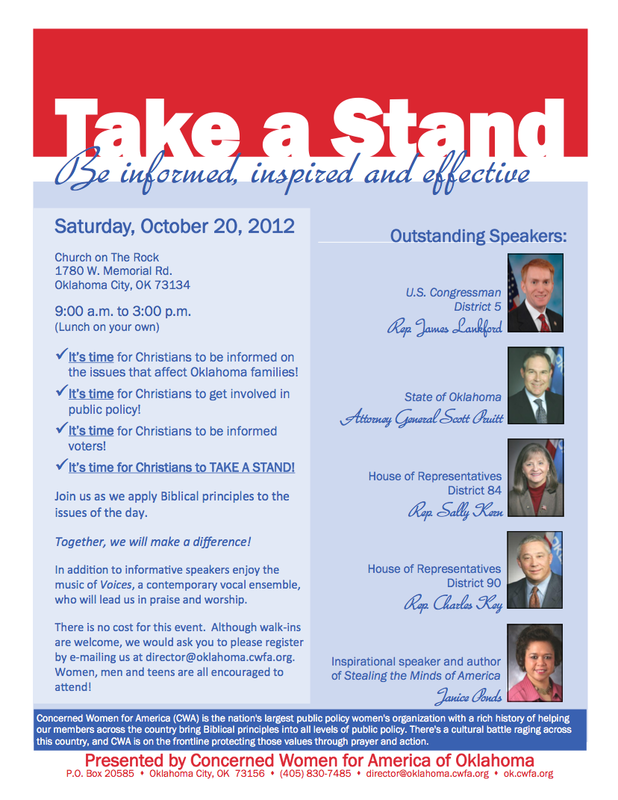 Charles Key will be speaking at the Concerned Women for America (CWFA) conference on October 20th at The Church on the Rock in OKC at 1:30 PM. His topic is Religious Liberty, The Constitution and the Declaration of Independence. Other speakers will include Sally Kern, Scott Pruitt, and James Lankford. Bible StudyBind them down with the chains of the constitutionCharles KeyChristian MinistryChristian Women's AssociationConcerned Women for America (CWFA)conservativesConstitutionCOTRCWACWFA.orgElectionsFinding Gems (FGST)flyer for CWFA eventFreedomGrassrootshistoryJames LankgordJanice PondsJury Nullificationlibertylife and libertyMoral AuthorityOKgrassrootsPersonal LibertypoliticsPrayerReligious LibertySally KernSandra CrosnoeScott PruittSheridan CrenshawTaking a StandTeapartyThe Church on the Rock OKCThe ConstitutionThe Declaration of Independence. I certainly hope that “Religious Liberty” stuff includes the Right to be Free of any religious dogma at all! Remember that pesky Bill of Rights?